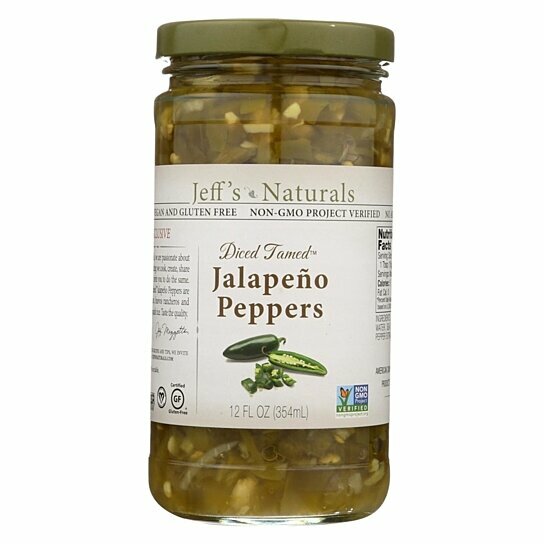 Jeff's Natural Jeff's Natural Jalapeno Peppers - Jalapeno - Case Of 6 - 12 Fl Oz. QTY 1234567891011121314151617181920212223242526272829303132333435363738394041424344454647484950515253545556575859606162636465 Please select a quantity. Jeff's naturals diced tamed jalapeno peppers is created exclusively for us by horticulturists at texas a&m university by combining traditional jalapeno peppers with bell peppers to create a proprietary harmless jalapeno.Enjoy the pepper flavor with much less heat.Sourced in california and packed within 24-hours of harvest.Each 12 fl.Oz.Jar of jalapenos is non-gmo, gluten-free, vegan and kosher.